Ease of Use First of all, it's made for Mac with folklore in mind. 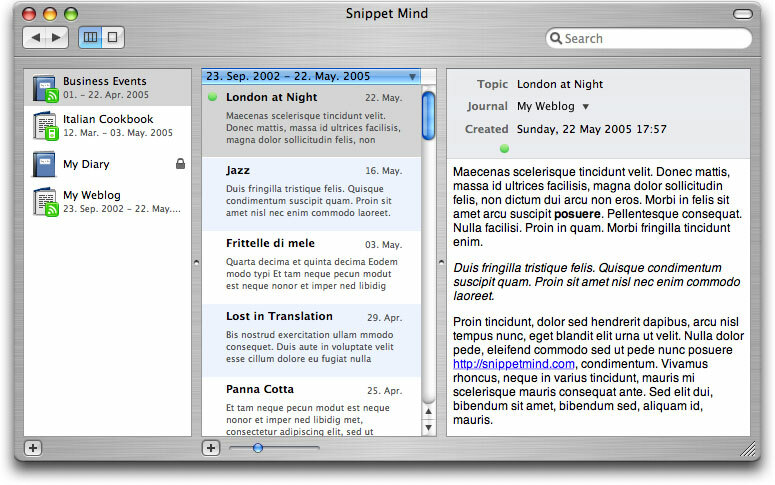 If you know how to use Address Book, iTunes, iPhoto, Safari or Finder, you already know how to use Snippet Mind. Organize Your Thoughts Snippet Mind lets you import, arrange, search and publish journal entries quickly and easily. You may use journals, color-coded categories and labels to organize your thoughts. 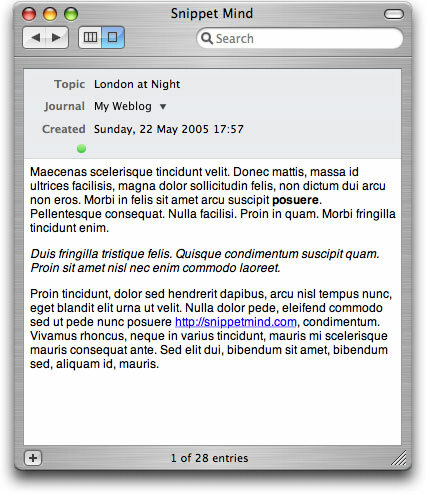 Different Views The collapsed and expanded main view along with various possibilities to emphasize journal, category or label information in the timeline shows your life in new and different ways. Spotlight on Search Of course your can search your data from within the application. 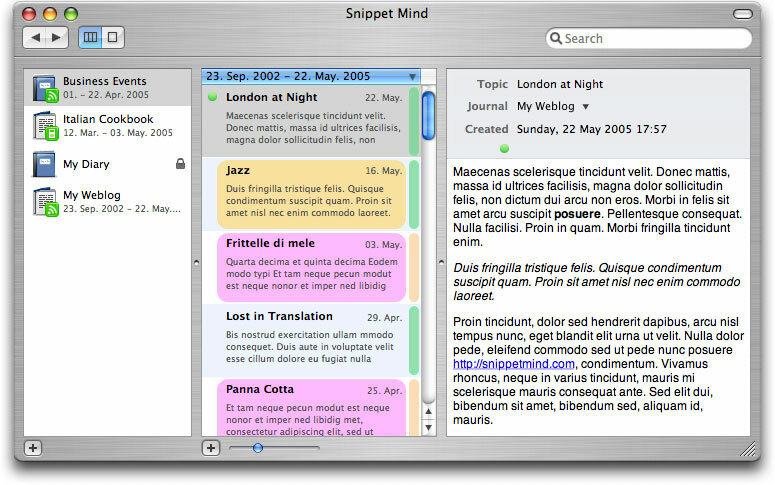 And, even better, Snippet Mind journals are accessible via Spotlight. iPod Integration Export your journals to your iPod. 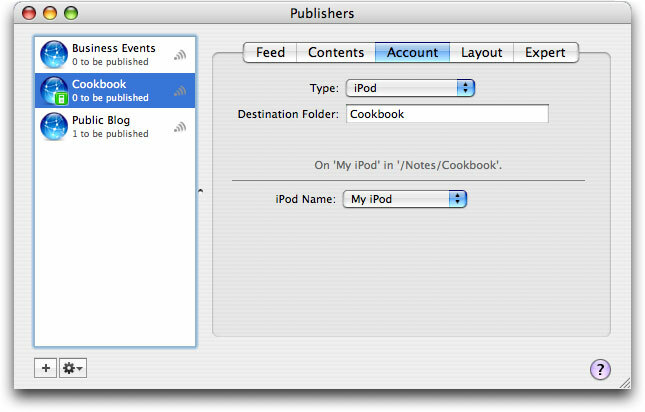 For example, put your Cookbook journal on an iPod to have your recipes and ingredients right at hand. Security Keep private data private with strong AES 256 bit encryption. Two level security (password protection and encryption). Import / Export Import and export Microsoft Word, Rich Text (RTF, RTFD), HTML, and text files. 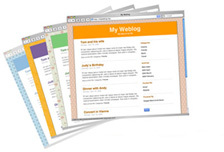 Weblog Aware Publish your personal or business weblog on your .Mac account or a local volume. Generates RSS2.0, RSS1.0, RSS 0.92 and Atom 0.3 compatible feeds. Unique Look Choose from a number of pre-defined layouts to publish your weblog. Or build your own using our Layout Plug-In SDK. Layout Plug-In SDK Snippet Mind comes with a number of simple but beautiful weblog layouts. But there is room for more. For more layout. Layouts from you! Demo Limitations The demo version is limited to 2 journals, 20 entries, 1 publisher and will expire after one month.